- Builders Board® is Unique - Super Heavy Duty and Spill Resistant!, an incredible 1.2mm thick and even safe for fork lift trucks....job done! Many more products available.. Please give us a call NOW on 01268 768 768.. We are here to help you! Did you know one of the largest costs in both time and money during any type of building, refurbishment or construction projects is caused by having to replace damaged surfaces? Whether it’s damage from a dropped tool onto a marble, ceramic or real solid wood flooring, or maybe paint, plaster, chemicals and grout spillages drying to kitchen worktops and windows, the cleaning up and repairing process can be a painful and time consuming task. Not to mention the money spent replacing the material if it can’t be repaired. Have you tried Zip Wall or Visqueen Wall? Keep the dust out when making a mess with our fantastic Temporary Polythene Wall Systems! Temporary Floor, Carpet, Window and Surface Protection Materials are of great importance as they help to prevent costly damage during building and construction projects. With a lot of flooring finishes installed during construction, it makes a lot of sense to avoid extra cost of replacement or cleaning that might be caused by damage while other trades and projects are taking place. This is something that you can achieve through the use of Temporary Floor Protection from Tempro. The main reason why you need temporary floor protection is for obvious reasons – to protect floors and surfaces as these are the most vulnerable during any kind of building work. The right floor and surface protection products will help you protect construction sites, no matter how messy the job might be. Whether you are repairing an occupied living space, or are demolishing a unit, floor protection will assist you to prevent damage of property. Cleaning up is part of any construction project, and the less cleaning you do, the faster you are likely to complete the task. With temporary floor and carpet protection, you can clean up construction sites faster because protection materials help to prevent debris and dust from sticking to surfaces. After removing the temporary protection and doing a little clean-up, you will find your surfaces and doors to be as clean as they were before you started working. Most floor protection materials are designed to be removed quickly, and therefore you don’t need to spend a lot of time tidying up after you are through with your work. Not only does temporary floor protection help to make cleaning up easier and protect surfaces, it also helps to create a safe working environment. Most floor protection materials are designed to prevent accidents and improve overall safety as most of them have various safety features. For instance, protective sticky mats don’t just protect floors from debris and dust, they also increase traction on floors being worked on, preventing slips and fall. In addition, products like corex sheets and floor tapes come with extra visibility features that can be used to signal extra caution in places prone to accidents. Dust Sheets are a thing of the past as they are “un-safe” instead consider Sticky Shield which is a self adhesive “dust sheet” on a roll which sticks to the floor and doesn’t move when walked on or if a ladder is being used! Handrails and balustrades are some of the most damaged point in homes, offices, hotels etc when doing any construction work or when a house moving is underway. Carrying furniture around can be very tricky and one drop or slip can put a huge dent in your balustrade or handrail. Here, all you need to do is apply a simple foam handrail protection and you do not have to worry about fixing your stairs. You can therefore concentrate on the construction or moving your furniture around…fast! To make sure that carpets are not damaged during construction or when moving, people usually use old coverings or dustsheets. However, these materials can cause serious trip hazards when moving around. Instead of such materials, you can consider using self-adhesive protection films to protect your carpet. Buy Sticky Shield, the award winning range of colour coded self-adhesive protection films Only from Tempro. There are a lot of materials that can be used to offer temporary hard floor protection. Some of these materials include self-adhesive films and corrugated plastic sheeting. All these are highly durable and offer the needed impact resistance. Doors are the busiest when a construction, building, or moving project is being conducted at your home. Due to this, they are very susceptible to damage while moving things in and out. The frame can be protected using a foam door jamb. The door itself can be protected using corrugated plastic sheeting or a polythene door sleeve. Such materials are critical to ensure door protection before any damages are incurred. Walls are always at the mercy of being scratched or chipped when construction projects are being undertaken at your home. This is something that can be easily solved by applying self-adhesive films or correx (corex, proplex) sheeting against a wall. Additionally, screening materials like polythene can be draped over a wall to offer simple dust protection. Finally, we have exits and entrances. During construction or when moving, a lot of dirt can be brought in very easily and this can be worse if it starts raining. Something as simple as placing sticky dirt / dust trap mats at exits can help to prevent wet and dirty feet traipsing around your house. It is advised to use the right form of protection, depending on the aforementioned factors, as an incorrect choice might lead to poor performance. This would create the need to replace protection on a frequent basis, leading to higher overall costs. For hard floors such as marble, timber, and laminates, a certain amount of impact protection is required to safeguard heavy traffic going over it. This is mostly used where equipment or tools are being utilized because, for instance, a dropped hammer can easily cause a dent on the surface of your floor. To avoid this, there are numerous forms of protection that can perform exceptionally against impact damage. One of the most popular materials for this purpose is correx (corex). The board offers a very high level of sturdiness and durability while still being lightweight, meaning that it is very easy to handle, supplied in Sheets or on the roll and in “standard” or “flame / fire retardant” types and can be printed with your logo!. In the case of soft surfaces like carpets, impact protection is not usually a big issue. For cut-pile carpets, self-adhesive carpet protector can be implemented, which comes in different sizes. This material is simply rolled out and will stick directly to the carpet without the need for more fixing to hold it in place. Courtesy of the ‘sticky back’, the material is able to hold itself in place during the project. After everything is complete, the product simply peels clean, leave no traces. Note that this is a short-term solution and should not be used for more than 4 weeks. This is because, longer use has the potential to leave residue on the carpet. Sticky Shield Adhesive Protection Films are the best floor protection materials you can ever find in the market. Nothing compares to them and their prices are quite friendly. At Tempro, we are the leading suppliers of temporary floor, windows, carpet, and surface protection materials. 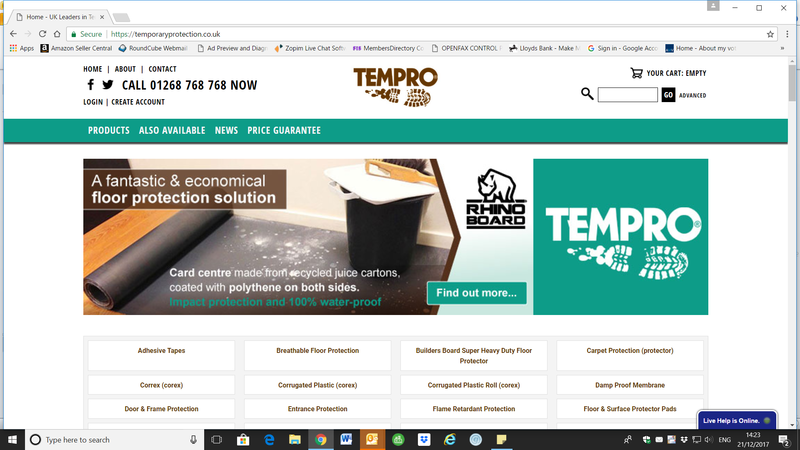 There are many available products such as Rhino Board Floor Protector, Breathable and Spill Resistant Floor Protector, Correx Corrugated Plastic, and many more. Due to our wide variety, we can proudly say that there is something for everyone. We supply some of the largest companies in the world that handle construction work. We offer them products that ensure both they and the assets of their clients are protected from damage that might happen during the construction process. In the long run, this helps to save time and money that might be incurred in case of damages to your clients surfaces. Don’t take the risk! ; ensure that your site is well protected. We also offer a massive range of Flame / Fire retardant products, conforming with LPS1207 and the LPCB Building Regulations, ideal for Ship, Boat Repiar and Builders etc. We are distributors of the fantastic Corrugated Plastic (correx, corex)). If you are in search of the highest quality Corrugated Plastic, you are in the right place. Our correx is made right here in the UK, and you can therefore be assured that you are getting the best quality of the same. Correx is branded and un-like cheap imported Corrugated Plastic from China it is tried and tested as floor protection and is thick enough and strong enough to do the job required, Unlike products from Chgina which are too thin! 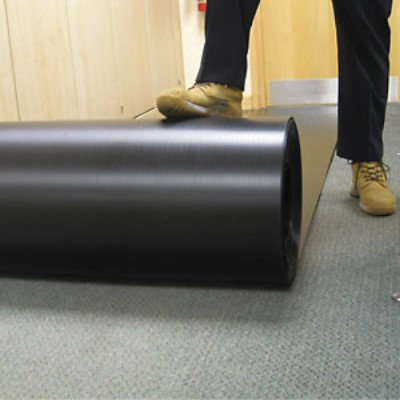 We offer a wide range of corrugated plastic for temporary surface and floor protection. Additionally, we can customize the correx to fit your needs. Therefore, if you are looking for custom Temporary Protection Materials we can help! Our Correx Corrugated Plastic fits numerous uses such as offering floor protection, creating rabbit cages, and installing estate agent signs. Our correx is water-proof, impact resistant, and chemical resistant. The material is heavily used around building sites by contactors and builders. Builders and contractors can never go wrong with our tested range of temporary window, carpet, and surface protection materials. You can stop damage or mess that can be caused on floors by any kind of construction or building project that is going around your home. The main products here include: Sticky Shield range of Adhesive Protective Tapes and Films, Twinwall Polypropylene Corrugated Plastic in Sheets and on the Roll, Builders Board Floor Protector, Rhino Board, Polythene Sheeting, Megafilm, Tuffreel, Visqueen and many more…. We are suppliers of temporary carpet protection products. Whether you are a painter, builder, joiner, Ship Repair Company, tradesman, Hotel Refurbishment Company, or caravan dealer, our products are here to help you out. Even if you are just a home owner and would like to offer protection to your carpets during construction or moving, our products can certainly be of benefit to you. Our temporary carpet protection is very easy to use and will offer the needed protection to your carpet saving you a lot of costs that you would incur in carpet repair or replacement. Unlike cheap imported products from China our product is Branded to guarantee the quality and colour coded to ensure you do not apply the wrong film to the wrong surface! Rhino Fleece can be used to offer protection to floors, carpets, and all kinds of surfaces from damage that can be caused during construction work or when moving. This is a unique product that has the following incredible features: 100% water resistant and self-adhesive backing that makes it stick to the surface without moving unlike traditional dust sheets. We are the leading UK supplier for all kinds of Polythene Sheeting and any other Polythene products. We stock a wide range of these including Black Polythene, fire & flame retardant poly sheeting rolls, visqueen, tuffreel, megafilm, recycled, virgin grade, Dump Proof Membrane Films, multi folded, and many more. Windows and glass attract a lot of debris and dust. At the same time, they are quite hard to clean. Using our window protection products will save you a lot of time and cost that might be incurred in case of damage. The protection products here include: corrugated plastic, self-adhesive protection tapes and films, dust sheets, and polythene sheeting rolls. If you are in need of this, contact us today. As earlier mentioned, doors and entrances see quite a lot of activity and can easily get damaged when conducting building and construction projects. In this area, we offer a wide array of protection solutions so that you can relax and forget about damaging anything around your home. This is a super-heavy temporary floor protector that is ideal for newly laid screed floors as it allows it to breathe. Contrary to most floor protectors, Builders Board is spill and water resistant. We stock a variety of polythene sheeting rolls like Damp Proof Membrane films and also polythene that can be utilized for packaging and protection purposes. And, this can all be customized to fit your specifications. Protect glazing from damage and mess when decorating, plastering, or when doing other kind of construction work around your home. This helps you avoid costly damage to hard surfaces like cupboards, kitchen worktops, sanitary ware, and a lot more. As you can see, we have a lot of products to offer to you. Interested in any of them? Contact us today.